A team of physicists led by a professor at UC San Diego has pinpointed the location of a long lost light reflector left on the lunar surface by the Soviet Union nearly 40 years ago that many scientists had unsuccessfully searched for and never expected would be found. 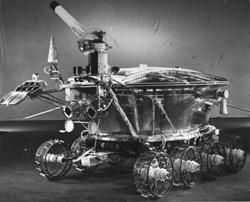 (Soviet Rover) The Soviet Lunokhod rovers were about 2.3 meters long and 1.5 meters tall. Murphy said his team had occasionally looked for the Lunokhod 1 reflector over the last two years, but faced tall odds against finding it until recently. 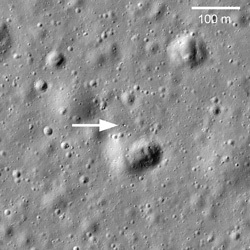 The breakthrough came last month when the high-resolution camera on NASA’s Lunar Reconnaissance Orbiter, or LRO, obtained images of the landing site. The camera team, led by Mark Robinson at Arizona State University, identified the rover as a sunlit speck on the image—miles from where Murphy and his team had been searching. (see: http://www.nasa.gov/mission_pages/LRO/multimedia/lroimages/lroc-20100318.html ) But until now the existence of the reflector or its precise location was unknown. 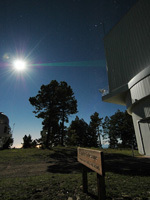 (Apollo) Laser beams are sent to reflectors on the moon from a telescope in New Mexico. Murphy and his colleagues found in a study they published this month that lunar dust may be obscuring the reflectors on the moon. see: Moon Dust His team found that the laser light they bounce off reflectors on the moon is fainter than expected and dims even more whenever the moon is full.